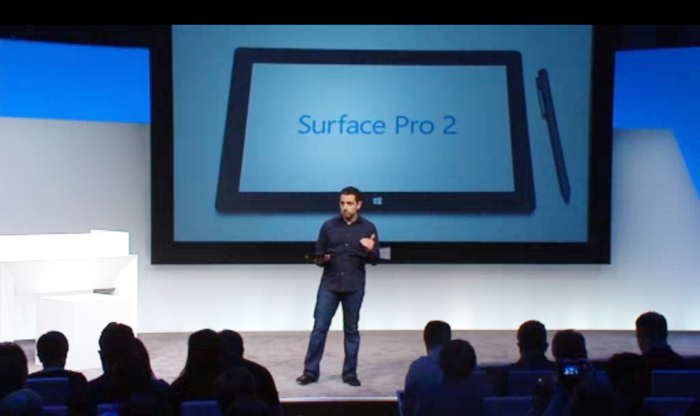 Finally on Monday in an event in NY Microsoft introduced the new family members of Microsoft Surface; Surface 2 and, Surface Pro 2. The Microsoft surface Pro 2 is a next generation tablet pre-loaded with Windows 8.1 Pro and equipped with the latest and the most powerful Haswell fourth generation Core i5 chip. According to Microsoft's Vice President Panos Panay, Surface Pro 2 is faster than all tablets / all 95 percent of laptops & ultrabooks available in market. Microsoft has not make major changes in Surface Pro 2 apparently in comparison to older version, despite of addition of a one more angle of 45 degree along 22 to Surface Pro 2 kickstand (built-in) for better portable use. 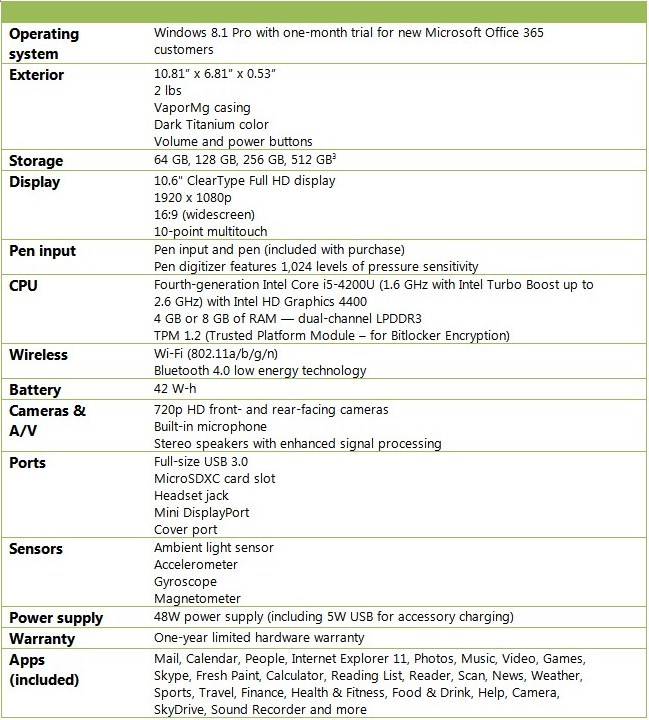 Even the dimensions (10.81 x 6.81 x 0.53 in), the full HD screen of resolution 1920x1080 pixels, weight (907 gm approx. ), and color (murky titanium) remains unchanged. 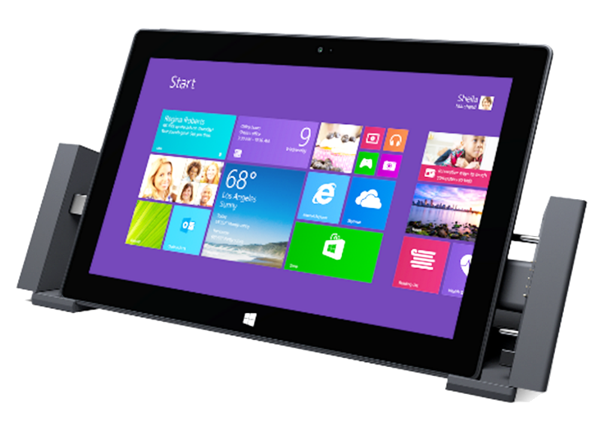 A total of five ports are given in Surface Pro 2. On left side of hardware you can see a 3.5mm Headset jack, volume button and USB 3.0 port at bottom for quick data transfer. And, the right side includes a microSDXC card reader, port to charge tablet, and the last one mini DisplayPort at bottom for video output after connecting Surface Pro 2 with HDTV or Projector. 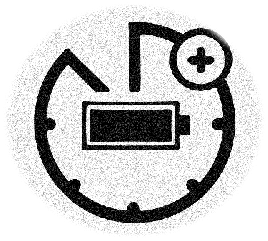 After significant improvements the Surface Pro 2 battery life enhanced almost 75% in comparison to older Microsoft's Surface Pro, means more work and fun on single charge. 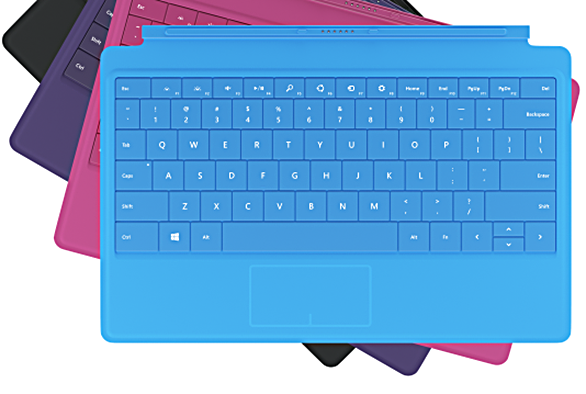 The Surface Pro 2 supports attachable keyboards but, you need to buy these cover(s) (keyboard) separately for your tablet because these are not included in the box. Touch Cover 2 is a light weight, thinnest, magnetic, smooth, support touch guestures, with illuminated keys to work easily in darkness too. 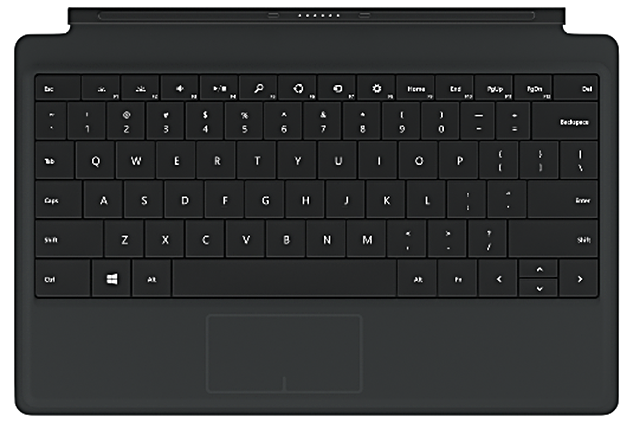 As all rest of the Surface Pro 2 covers, Touch Cover 2 is also a dual purpose, pressure sensitive keyboard and protective cover in one. To use Surface pro 2 in full touch mode you can fold cover to tabs back. Flip it over the screen for protection when you are not using tablet. Touch Cover 2 comes only in black color at price of 120 USD. It is one of the thinnest mechanical qwerty keyboards with touchpad available in market. It comes in four different cool colors; blue, pink, purple and black with backlits to play and work easily in all lighting conditions. Type Cover 2 price is $130. 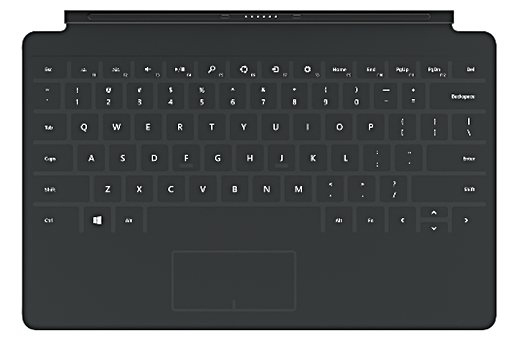 As its name reflects, Power Cover is a thicker (than Touch and Type Covers) qwerty mechanical dual purpose detachable full keyboard with a built-in power storage which can enhance your Surface Pro 2 battery life up to 60%. Power Cover 2 price is 200 USD and will be available only in black color from 2014 first quarter. Arc Touch Mouse is the another expensive gadget for those rich people who need everything latest and new for their new surface pro 2. Arc Touch Mouse is super portable, light weight, wireless advanced mouse with stylish eye-catching design. To get started just simply give it a curve, to scroll webpages instead of traditional wheel a haptic motor touch strip is given for navigation with precise control. 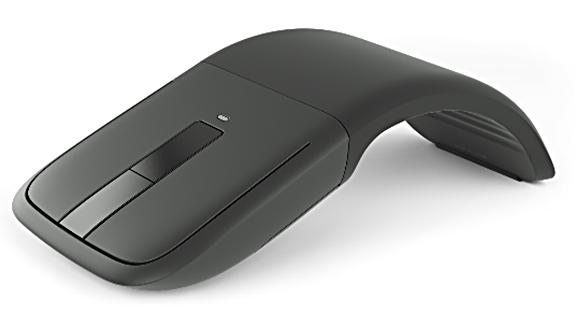 Surface Edition Arc Touch Mouse price is $70 and can be pre-order with surface pro 2. Dock station is another useful accessory especially designed to drive additional peripherals; printers, projectors, monitors, keyboards, mice,etc.for desktop like usability. Docking Station price is 200 USD and it will be available from 2014. With the purchase of Surface Pro 2 you will get a $30 Digital Pen in the box for free. 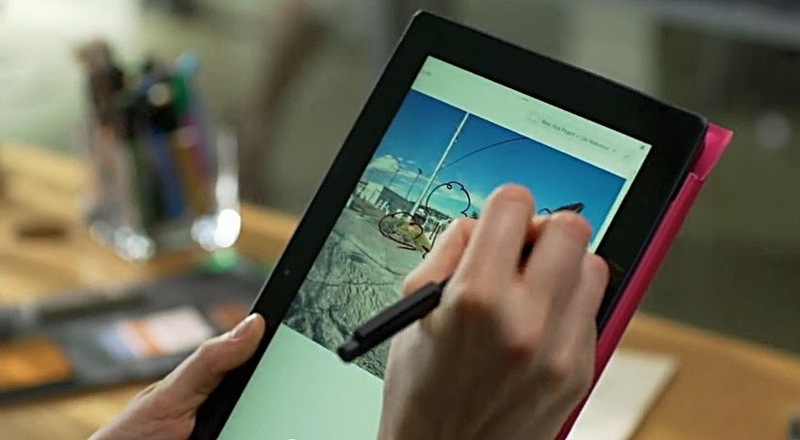 The surface digital pen allows you to mark docs, take notes and, sketch your ideas with ease. The another useful giveaway by Microsoft with purchase of Surface Pro 2 is the availability of 200GB space on SkyDrive for two years of actual worth $100/year. Additionally, buyer will also get unlimited calls for a year on landline from Skype in around 60 countries. From 22nd October 2013 The Microsoft surface pro 2 models with storage of 64GB (4GB RAM), 128GB (4GB RAM), 256GB (8GB RAM), and 512GB (8GB RAM) will be available on Stores at price of $900, $1K, $1.3K and $1.8K, respectively. Overall Microsoft surface Pro 2 is an amazing product. It is the most powerful tablet and it would be a great option for professionals and, for people who need fully featured tabs to grow their business not just to play higher-end games or for internet browsing. I have a Samsung Galaxy Tab3, but now I'm thinking about Microsoft Surface. This accessories are amazing.